Today’s first reading (1 Kgs 19:9A, 11-16) tells the famous story of the persecuted and pursued prophet Elijah encountering God in a special way. Neither in the chaos and fury of tornado force winds, nor in an earthquake, nor in fire, did he meet the Lord in his desperate need. Rather it was the “tiny whispering sound” that alerted Elijah to the presence of Yahweh. While the earlier events certainly got the great man’s attention, it was only to prepare him for the “still small voice” (as the Revised Standard Version and others beautifully translate it). I wonder what God whispered? In our “progress,” the world has become an increasingly “noisy” place, particularly starting with the introduction of radio followed by television, and in our day with the advent of the internet, smart phones, and social media. As we see, noise is not limited to sound, but rather it inundates us in the busyness, distractions, and procrastinations of life. But this reality should make us all the more eager for quiet time, even if it’s a few minutes each day before everyone gets up or after everyone is asleep (or ideally an occasional hour in front of the Blessed Sacrament [see Mt 26:40]). It is in these times that we should take the opportunity to commune in a special way with our Creator, talking less (see Mt 6:8) and listening more. Even Jesus had to get away from time to time (see this article by Fr. Mitch). His mission was more important than any person’s in history. If He needed to do it, what excuse can we make? 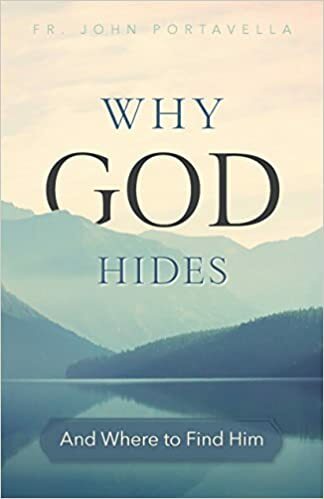 Coincidentally (and providentially, I think), I recently came across the new book Why God Hides which is next on my spiritual reading list. I certainly have wondered at times why God seemingly hides. I know that He is always with us, always fathering, always listening, always caring, always loving. But it doesn’t always feel that way (so much for feelings, huh?). Most likely because I am not taking the time or space to really listen. I look forward to Fr. Portavella’s insights. While there usually are not explicit links among the reading during weekday Masses, I found, with the help of the priest’s homily at morning Mass, a wonderful correspondence among the three Scripture passages proclaimed in the Liturgy of the Word. For starters, the psalm response, I long to see your face, O Lord, captures well Elijah’s lament and ours in this life and in hope for the next life. Psalm 27 is a wonderful meditation in times of difficulty. Finally, the gospel warns of the sin of lust. While the amount of information on which we can get our hands in an instant today would have been unimaginable even a few decades ago, with the good comes the bad. The dissonant noise of explicit images and videos serves only to distance ourselves from God and neighbor, sometimes cutting us off completely from both. Here again we must immediately seek shelter in the calm and quiet of our heavenly Father’s arms for protection so we can hear His “gentle whisper” (New International Version and others) and in the warmth our Blessed Mother’s bosom to hear the beating of her Immaculate Heart.